I love okra. . . stewed, fried, pickled, sauteed. . . you name it and I love it! 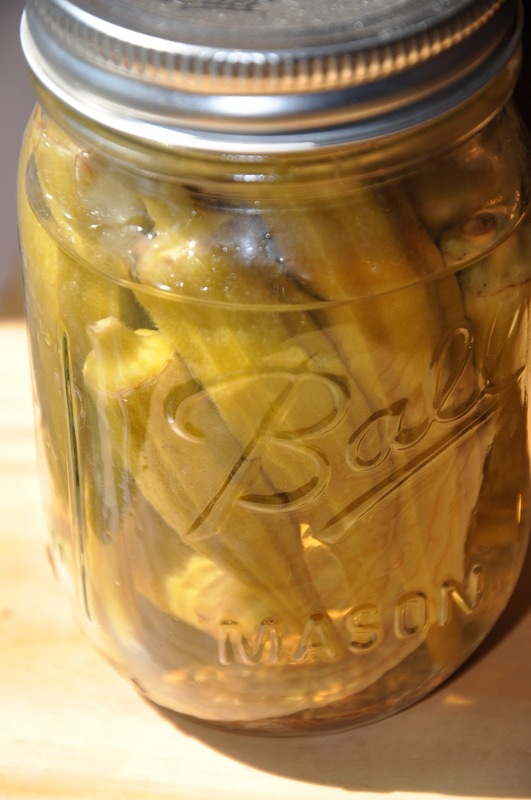 This summer I made pickled okra . . . and Nate and I both thought it was amazing! But the true test was when I took the okra to the Dalton family reunion. . . which consisted of a huge group who have been pickling and canning longer than I have been alive. . .
1. Bring canner half-full with water to a boil; simmer. Meanwhile, place jars in a large stockpot with water to cover; bring to a boil, and simmer. Place bands and lids in a large saucepan with water to cover; bring to a boil, and simmer. Remove hot jars 1 at a time using jar lifter. 2. Pack okra into hot jars, filling to 1/2 inch from top. Place 1 pepper, 1 garlic clove, and 1 tsp. dill seeds in each jar. Bring vinegar, salt, sugar, and 4 cups water to a boil over medium-high heat. Pour over okra, filling to 1/2 inch from top. 3. Wipe jar rims; cover at once with metal lids, and screw on bands (snug but not too tight). Place jars in canning rack, and place in simmering water in canner. Add additional boiling water as needed to cover by 1 to 2 inches.